Go forward in time to January 2013. Mario has been working on the insecure content API for WK2GTK. Jon has been rocking in Epiphany by improving the creation of Web Applications by sniffing icons and application names and revamping our Find bar. Carlos has been improving the DOM bindings to make them shareable between webkit1 and webkit2, adding WebKit API to set a SSL errors policy, and working in documents integration in Epiphany through libevince. Diego has been working on the Web UI/UX from the distant Lima: Adding undo close tab (ctrl+shift+t) and preventing empty download-only (target=_blank) windows. Martin has switched WKGTK+ to use Harfbuzz to render complex text and deleted the old Pango complex text backend. He also worked on adding authentication support to DRT and WTR. 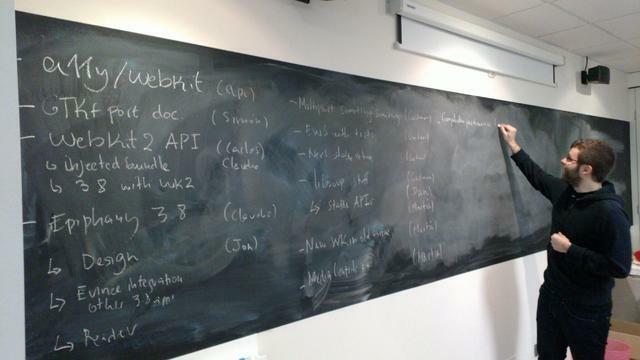 Philippe has been porting the WebAudio backend to GStreamer 1.0. Berto has been cleaning up the WebKit code and fixing WebAudio bugs. Joone has been working on Accelerated Compositing with Clutter and fixing common bugs in EFL and GTK+ ports. Gustavo has released WKGTK+ 1.10.2, packaged it and uploaded it to Debian along with Epiphany 3.6.1. He has also landed multipart/x-mixed-replace, reviewed a bunch of patches, and worked on improving how clicked links are opened in epiphany. Dan has been stabilized the unstable libsoup APIs, and he is now debugging and unskipping HTTP tests. Alex has been working in 2D-canvas accelerated support using cairo-gl and discussing with others threaded models for coordinated graphics. Andy has been working hard on decreasing the world's entropy by decreasing V8's memory usage. He is also fighting Capitalism from within. Xabier has been revamping the HTML5 media controls in WebKit and occasionally breaking the bots like a champ. Žan has been working with Xabier in the media controls and has been also improving our testing infrastructure. Simón has been improving the WK2GTK+ documentation. Alejandro and Joanie have been working on decreasing the number of accessibility tests skipped/failing on the ATK implementation. Claudio has been finishing the WK2GTK+ API for snapshotting, reviewing Epiphany patches, and testing the netbanking mode. 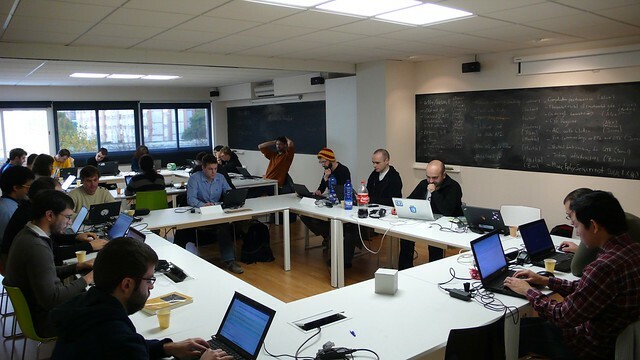 There is, of course, much more going on and it's hard to keep track of the activity of these brave and energetic hackers. Yours truly has had a hard time distracting them from their relentless hacking in order to compile this report -- rest assured that there is probably much more happening between these four walls than what you have just read here. 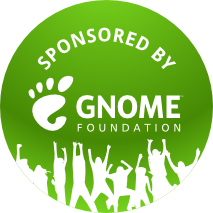 Nevertheless, we all want to thank the GNOME Foundation and all the sponsors who have made this gathering possible. Igalia is looking for a Free Software enthusiast living in the San Francisco Bay Area to work with us in the role of Sales Engineer. If you're reading this, chances are that I don't need to tell you who we are, what we do, how we do it, and what our core values are, nevertheless, if you want to know more, please read the job opening in our webpage. If you have specific inquiries don't hesitate to contact any of us through the usual channels! Go backwards in time to November 2012.